(SPOT.ph) Brooklyn Pizza extends Christmas, CIBO Bimbi and Red Mango celebrate birthdays, while DADS Saisaki Kamayan is celebrating your birthday. These are only a few from this week’s roster of cheap eats-and if they’re any indication to how to year will turn out in gastronomic discounts, then our wallets and tummies are very excited. Happy birthday Red Mango! They're making their customers part of the celebration by slashing 50% off your second yogurt all weekdays of January. Promo is limited to one per transaction. 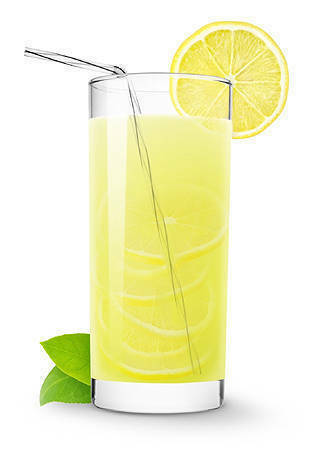 As long as you purchase something over P250, you (or your group) can get a free glass of lemonade or wintermelon tea. Promo is available for dine-in orders only. Red Onion is at G/F, UP Town Center, Katipunan Avenue, Quezon City. 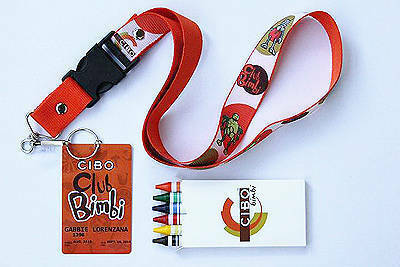 For CIBO Bimbi’s fifth birthday, the first 50 kids who dine at CIBO Bimbi Power Plant branch will get a Bimbi ID lace and a box of crayons. CIBO Bimbi members, however, will also get an additional pack of palmieri cookies! Promo is available until January 12. Good news, January babies! DADS Saisaki Kamayan is extending their free buffet for birthday celebrants until January 31. As long as you’re accompanied by a full-paying adult, you can avail of the promo within three days before or three days after your actual birthday. Bring a valid ID for confirmation. Click here for a list of DADS Saisaki Kamayan branches. 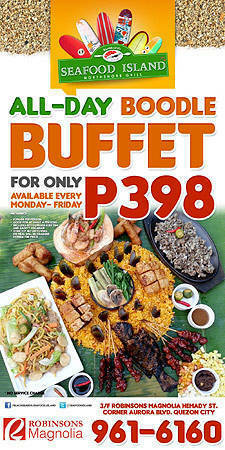 For P398 per person, you can indulge at an all-day Boodle Buffet at Seafood Island. The buffet is good for at least four people and comes inclusive of bottomless iced tea and sago’t gulaman. Promo is available from Monday to Friday at the Robinsons Magnolia branch. Katsu is good, but it can be fairly expensive. 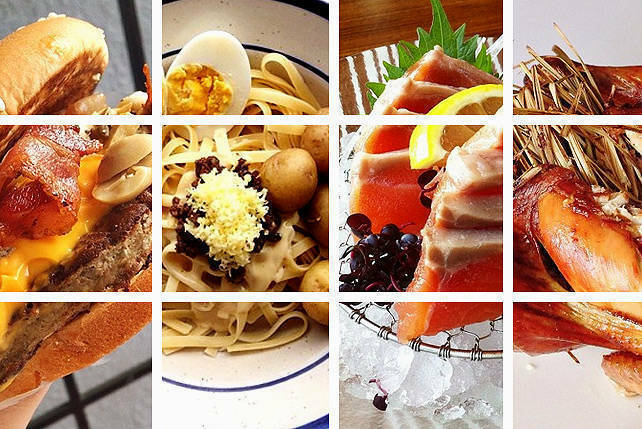 Find sets for a steal at Tonkatsu by Terazawa. 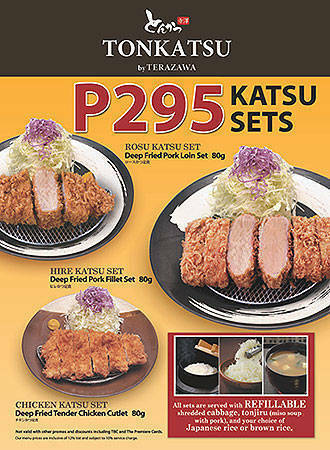 Only P295 for pork loin, pork fillet, and chicken katsu sets, complete with refillable cabbage, miso soup, and rice. 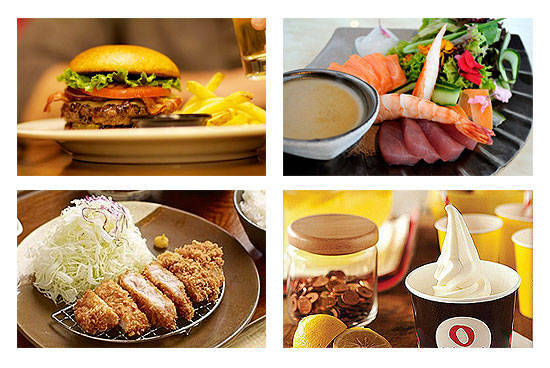 Dine in at Geisha and get 40% off on a minimum amount of P1,500 per person. P1,500 isn’t a lot when you compute the math. 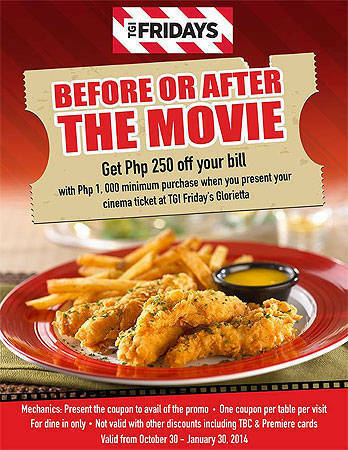 Slash P250 off your bill when you present you cinema ticket at TGI Friday’s in Glorietta. The catch? You must have a minimum purchase of P1,000 and only coupon is allowed per table. Promo is available at Glorietta until January 30, 2014. 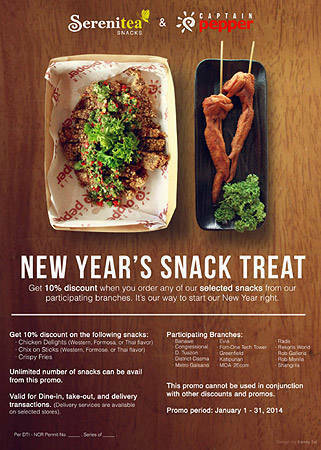 Get a 10% discount when you order Chicken Delights, Chix on Sticks, or Crispy Fries from participating Serenitea and Captain Pepper branches (view photo for complete list or participants). There’s no cap to how many you can order; promo is valid for dine-in, take-out, and delivery transactions. It’s still Christmas at Brooklyn Pizza! 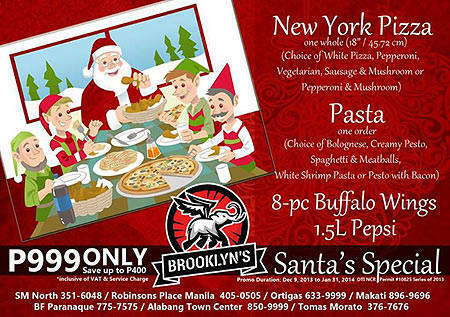 Save up to P400 when you get their Santa’s Special (P999) consisting of an 18-inch New York Pizza, a plate of pasta, eight pieces of buffalo wings, and a 1.5-litter bottle of Pepsi.